Parsley is readily available and widely used in cookery but it is often under-appreciated. It can be found throughout the year at the market, it’s cheap so just about anyone can buy it. Parsley is a highly nutritious plant and has ample vitamins and antioxidants which can greatly improve our health. Most people do not realize that this vegetable has more uses than just being a decorative garnish that accompanies restaurant meals. They do not know that parsley is actually a storehouse of nutrients, with a vibrant, green colour and delicious taste. Parsley is an excellent source of vitamins C, A, K, B6, B12, Vitamin B1 – Thiamine, riboflavin, niacin, pantothenic acid, choline, folate, calcium, iron, magnesium, manganese, phosphorous, potassium, zinc, and copper. It is also a very good source of volatile compounds such as myristicin, limonene, eugenol, and alpha-thujene. and is also helpful in the eradication of kidney stones, which is why drinking parsley tea for a continuous period of 10-14 days is often recommended. For bruises take a handful of fresh parsley leaves, crush them and spread them over the bruise. Wrap the bruised area with an elastic bandage and leave on for 2-3 hours or overnight to decrease inflammation. The two most popular types of parsley are curly parsley and Italian flat leaf parsley. The Italian variety has a more fragrant and less bitter taste than the curly variety. Whenever possible, choose fresh parsley over the dried form of the herb since it is superior in flavour. Choose fresh parsley that is deep green in colour and looks fresh and crisp. Avoid bunches that have leaves that are wilted or yellow as this indicates that they are either old or damaged. Store fresh parsley in the refrigerator in a plastic bag. 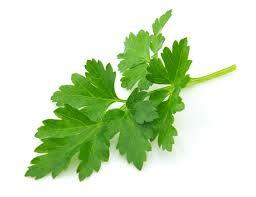 Parsley is also a terrific breath freshener and can help get rid of the most difficult odours. Therefore if you follow my advice, after eating lots of garlic and onions, or at the end of a rich business dinner, chew a few sprigs of parsley. 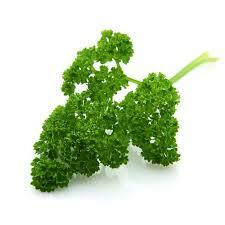 Parsley is rich in chlorophyll, a well-known breath deodoriser with germ fighting properties. It is reported that between 35 to 45 percent of the entire world’s population have chronic bad breath. Billions of dollars are spent on breath mints, mouthwashes, gums and pills. Normally you don’t know you have bad breath, because you can’t identify it yourself, but others near you can. Infuse 2-3 heaped teaspoons of washed and chopped parsley with one cup of boiling water. Cover the cup with a lid or saucer (this ensures that the volatile oils do not escape into the air). Stand for 5-10 minutes and strain before drinking.